A breakfast treat, perfect for sharing on lazy mornings. 1. Preheat the oven to 200°C, gas mark 6. Arrange the tomatoes, cut-side up, in a shallow baking tray and roast for 15-20 minutes until soft and juicy but still holding their shape. 2. Toast the bread. Divide the tomatoes between the toasts. 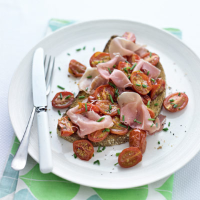 Tear the ham and scatter over the tomatoes. Season with black pepper, scatter over the chives, add a splash of Tabasco and serve. This recipe was first published in Thu Jan 19 11:05:00 GMT 2012.